SINGLE LEVEL CUSTOM BACKS TONTO NATIONAL FOREST--ABSOLUTELY UNOBSTRUCTED SUPERSTITION MOUNTAIN VIEWS! 2700 SF SPLIT FLOORPLAN FEATURES 3 BEDROOMS, 3 BATHS + OFFICE, 7 CAR GARAGE W/ LAP POOL ON 1.25 FENCELINE ACRES. 2018 POOL YARD REMODEL INCLUDES TRAVERTINE PAVERS, RAMADA, BBQ, SHRUBS, TREES & TURF. 2017 VIEW KITCHEN BOASTS BLACK STAINLESS APPLIANCES, STONEWOOD GRANITE, COPPER FARMHOUSE SINK & CUSTOM SOFTCLOSE CABINETS. 2017 MASTER BATH REMODEL SPORTS HUGE TILED WALK-IN SHOWER, GRANITE VANITY W/ CUSTOM VESSEL SINKS & FIXTURES. 2017 WOOD-LOOK TILE OFFICE FLOOR, BDRM CARPET. 12' GREAT ROOM VIEW WINDOWS. 2017 STAMPED CONCRETE DRIVEWAY & FRONT LANDSCAPE. 1800 SF RV HT GARAGE W/EPOXY FLOOR. $150,000 IN 2017 & 2018 UPGRADES. 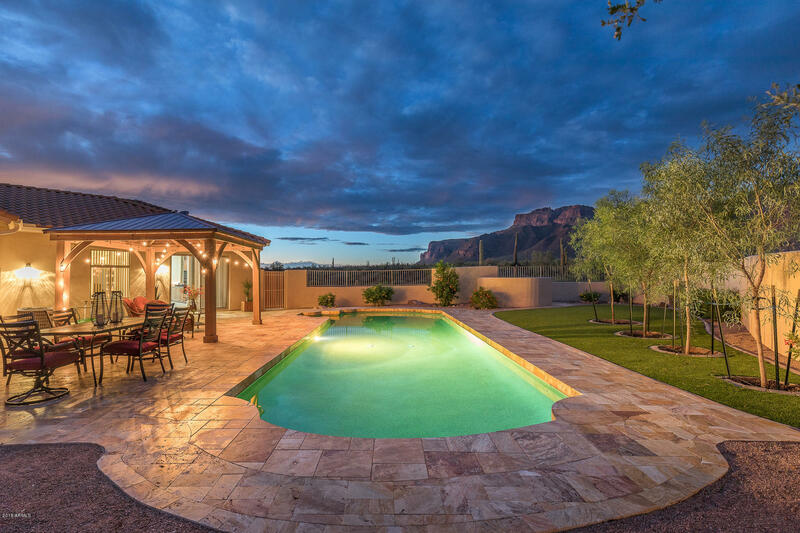 EXPERIENCE THE SUPERSTITION MOUNTAINS FROM YOUR PRIVATE PARADISE.